Truly, a helmet of the first order. A Star Wars First Order Snowtrooper helmet of your very own! Wearable prop replica duplicated from the original screen-used assets. Features adjustable fitting pads and a visor that opens! First Order Stormtroopers assigned to frigid planets like Starkiller Base wear specialized armor that includes the insulated betaplast helmet with a flared neck shroud and a visor which minimizes ice glare to let them operate effectively in icy conditions. 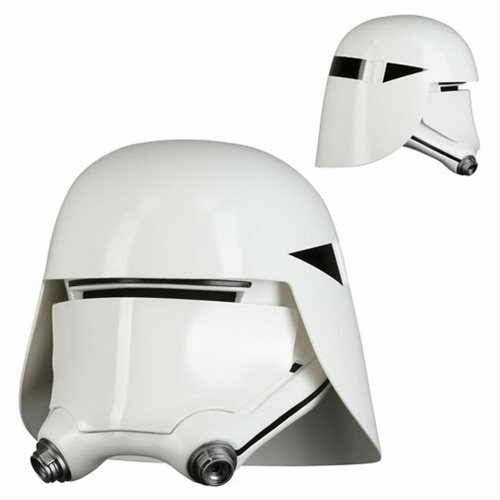 Here, Anovos offers you a Star Wars First Order Snowtrooper Helmet Prop Replica of your very own! With details duplicated from 3D scans and references from the original screen-used production assets, the helmet comes assembled and ready to wear. The exterior shell is constructed in fiberglass, and the interior is lined for a finished appearance. Visor opening uses dark fabric, per the original prop, and the fitting pads are adjustable and removable. Most Anovos helmets fit up to U.S. hat size 8. Please be advised that this item is neither a toy nor suitable for children. This article of costuming is meant for entertainment use only by adults and does not offer protection.